The cars will be mainstream, mass-market cars at affordable prices. Renault Nissan plans to launch 10 cars in the next four years featuring autonomous driving technology. The cars will be available in the U.S., Europe, Japan and China and will be mainstream, mass-market cars at affordable prices, the company said Thursday. Autonomous technology is hot in the automotive industry at present and most major automakers have either announced projects or are already working on the technology. The ultimate goal is a self-driving car, but that's expected to take several more years. In the meantime, autonomous technology is expected to come to cars in stages. Renault Nissan plans to add a "single-lane control" feature to cars this year that allows for hands-free driving on freeways and in heavy traffic. In 2018, the company plans to improve the system so it can navigate between lanes on a highway and autonomously avoid hazards and by 2020, the technology will have advanced enough to be able to handle city intersections and heavy urban traffic without driver intervention. 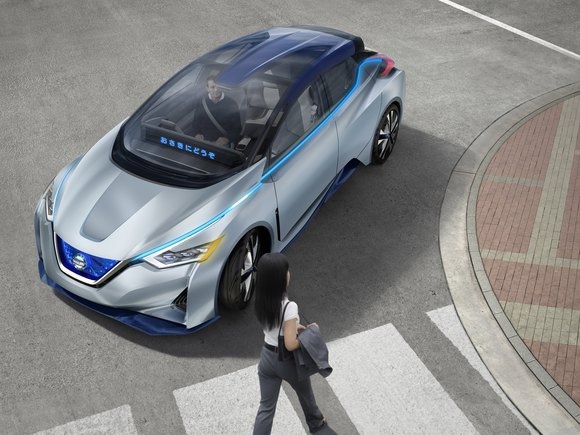 At November's Tokyo Motor Show, Nissan showed a concept car that married the company's electric vehicle and autonomous technology. The concept included a unique LED strip along the dashboard that could be used to send messages to pedestrians. In one concept image, the car is indicating to a pedestrian that it's aware of her and will wait for her to cross the street until it continues. Nissan's IDS concept car, unveiled at the Tokyo Motor Show on Oct. 28, 2015, combines electric vehicle and autonomous driving technology. Here the car displays a notice to pedestrians telling them the car will wait while they cross the street.